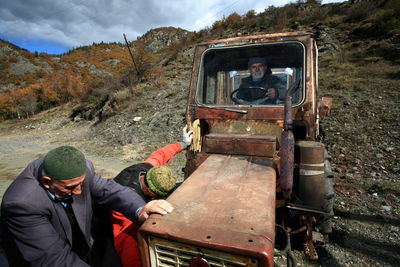 Alikhan Kuradze (at the wheel), 76, is taking help from the villagers to move to his new house in Abastumani, the village from where he was deported to Central Asia in 1944. 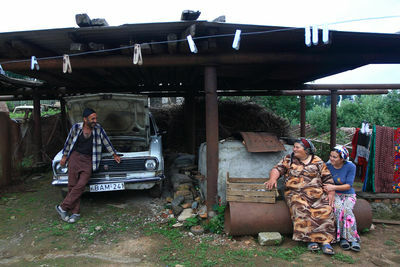 Meskhetian family in Nasakirali, Georgia. In mid-November 1944, around 100,000 Georgian Muslims from the southern region of Samtskhe-Javakheti were deported to Central Asia. The vast majority of them were Meskhetians (or Meskhetian Turks). In the course of WWII, they were perceived by the Soviet government to be Turkey's potential allies. More than 60 years after the deportation, a few families managed to return to their ancestors' land. 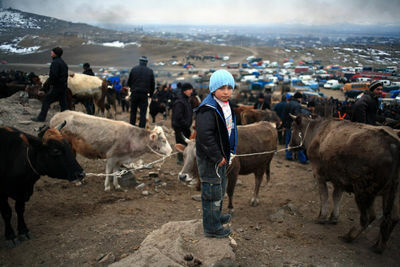 A weekly cattle market near Marneuli, Georgia. 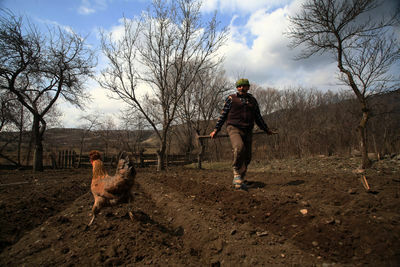 Marneuli, a town in southern Georgia, close to both Armenian and Azerbaijani borders, is widely populated by ethnic Azerbaijanis, traditionally sheep and cattle herders. 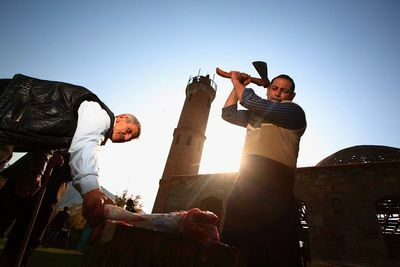 The market is a place of cattle trading not only for local Azerbaijanis, but also for Georgians, Armenians and others, who come here every sunday looking for a good deal. Residents of Abanotubani (Bath District), one of Tbilisi's oldest districts, enjoy tea at a local chaikhana. 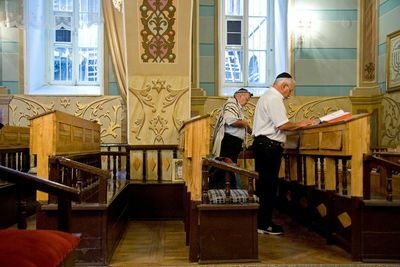 The Abanotubani chaikhanas have long become a symbol of ethnic tolerance. Here you can easily see Armenians, Azerbaijanis, Kurds, and Georgians sipping tea at one table, discussing local news, and planning common business. 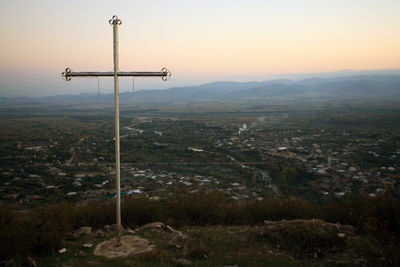 A cross overlooks a few villages in Bolnisi region in Southern Georgia. 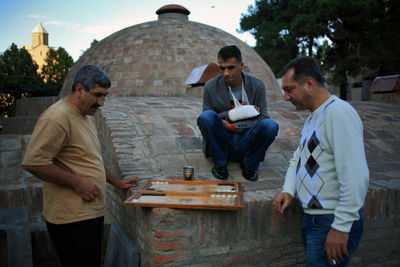 Bolnisi region is traditionally populated mostly by ethnic and religious minorities, mostly Azerbaijanis. 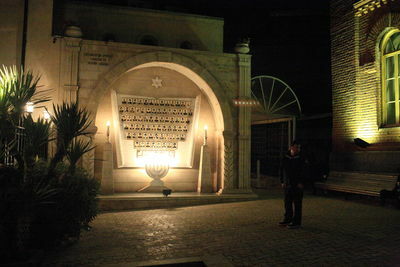 Such crosses are common throughout the country and are usually symbolically installed by local Orthodox priests and their congregation. In 2003 such cross was installed right at the town square of one of the biggest villages in Bolnisi region, populated mostly by Muslim Azerbaijanis. Offended, the villagers were ready to dismount the cross. 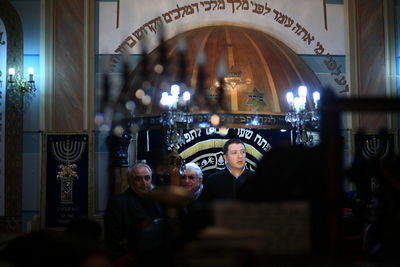 After receiving the call about this incident sheikh of Georgia Vagif Akperov, then a mollah in Tbilisi mosque, told villigares to guard the cross day and night, so that nobody would touch it, while he settled the issue down with the Georgian Church officials. "It was a provocation," says Akperov. "Whoever installed this cross, wanted us to destroy it, in order to say later that we're aggresive towards Christian symbols." The case has been quickly settled and the cross has been removed peacefully. Farida Dorsumova, a Meskhetian ninth-grader, laughs as she prepares comes out from behind the curtain during a performance dedicated to the high-school graduation. During the performance, classmates - ethnic Meskhetians, Ajarians and Ossetians, introduced each other by personal characteristics, danced and read poems in front of their teachers and other students. Dorsumova's family has recently returned to Georgia from Central Asia, where their ancestor's were deported to from Georgia in 1944. 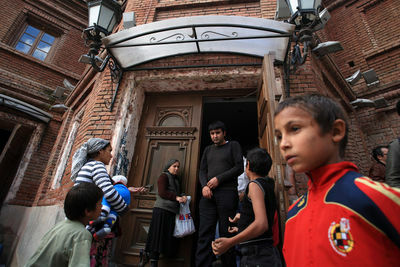 A Roma community in Tbilisi. Roma are one of the most stigmatized small minorities in Georgia. “They are savages,” “they all should be in prison,” “are they human beings at all?” These are some of the answers for a poll conducted by journalists in the middle of Tbilisi. The question that random Georgians were asked was “what do you know about the Roma people?” In Georgia at best they are associated with street sellers, beggars, fortunetellers, that is people, who bother you while you’re walking in the street. In a worse case - they are thought of as thieves and swindlers. 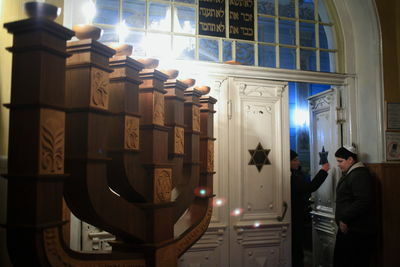 A Hanukkah prayer in Tbilisi synagogue. 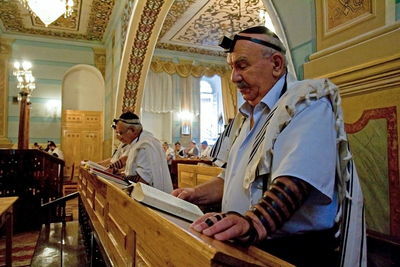 The Jewish communities of Georgia were oppressed during the Tzarist and Soviet times, but since the fall of the latter, the situation has improved dramatically. 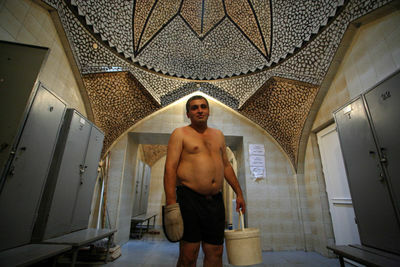 Roman Glonti, 42, a bathhouse attendant in Tbilisi baths. Glonti, born to Armenian father and Georgian-Iranian mother, has his mother's last name. He says that sulfur baths are the ultimate symbol for the multi-ethnic Abanotubani district. "There can be no quarrel between us, as the sulfur always soothes your mood," says Glonti jokingly. "We just weren't born in here, otherwise we spend a lot of time in the bath." 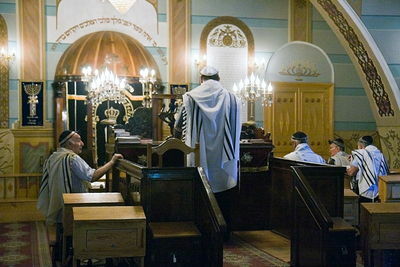 A prayer in Tbilisi synagogue. 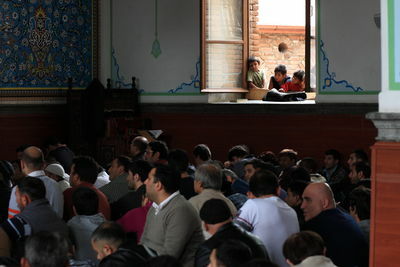 Roma beg at the entrance of Tbilisi mosque as worshipers are coming out after the end of the Friday prayer. 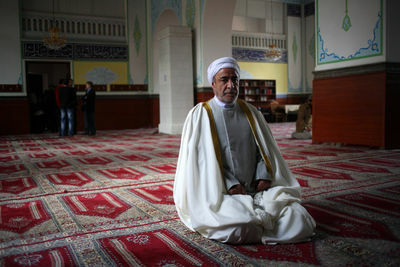 Roma children observe worshipers during the Friday prayer in Tbilisi mosque. After the prayer the Roma wait at the doors to beg. 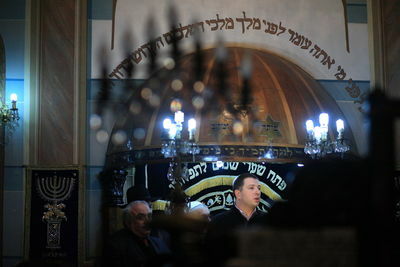 Vagif Akperov, Sheikh of Muslims of Georgia, inside the Tbilisi mosque. Erunz Nelson, a 54-year-old immigrant from Nigeria, is watching Lia Lemonjava, a hairdresser sharing the same store, perforate a local girl's ears for her first earrings. Lemonjava, who has been working with Nelson for the last six years, says that his a very honest and reliable person. But best of all, she says, is that "he loves Georgians." 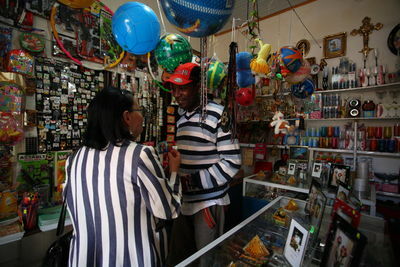 Erunz Nelson, 54, an immigrant from Nigeria inside his store in Tbilisi. He arrived in Tbilisi in 1995, got married to a Georgian woman, and now owns a mixed goods store. He says back when he just arrived in Georgia, there were "only 3-4 black people [in Tbilisi]." 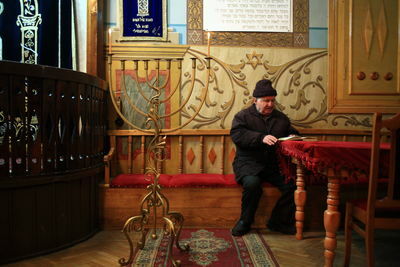 He says that during the last fifteen years the situation with tolerance has changed significantly, Georgians "got used to the foreigners," and it became safer to go to the street after dark. 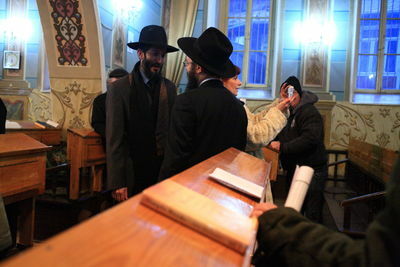 Ali Mekhriev (standing), a Meskhetian who recently returned to his ancestor's village Abastumani, is talking to the locals. 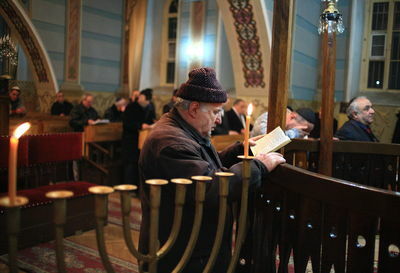 Ali's father told him their family would one day return to their motherland, Georgia, where they were deported from in 1944 by the Soviet government.